Forward Chaining: Conclude from "A" and "A implies B" to "B". If it is raining, the street is wet. Backward Chaining: Conclude from "B" and "A implies B" to "A". If there is more than one rule that can be applied (i.e. that can be "fired"), choose one to apply in the conflict resolution. If no rule applicable, stop. Apply the chosen rule, perhaps by adding a new item to the working memory or deleting an old one. If termination condition fulfilled stop, else go to step 1. "Aslan is-a lion" does not match "?x is-a horse"
Which facts match the preconditions of the rule? Forward chaining or data-driven inference works from an initial state, and by looking at the premises of the rules (IF-part), perform the actions (THEN-part), possibly updating the knowledge base or working memory. This continues until no more rules can be applied or some cycle limit is met, e.g. many rules may be applicable. The whole process is not directed towards a goal. Backward chaining or goal-driven inference works towards a final state, and by looking at the working memory to see if goal already there. If not look at the actions (THEN-parts) of rules that will establish goal, and set up subgoals for achieving premises of the rules (IF-part). This continues until some rule can be applied, apply to achieve goal state. More possible start states or goal states? Assume you are at home and you need some bread. You've one initial state and many possible goal states where to get bread from (Sainsbury's, Tesco, Aldi, Morrison, ASDA, CornerShop, Bakery). That is, in such a situation it is probably a good approach to search in forward chaining fashion, since you have many chances to hit a goal. If you choose backward chaining you would have to commit to one of the goals, e.g. the Bakery and then search backwardly how the get there from home. If, however, there are 5 people Alice, Bob, Claire, Dora, and Edgar at 5 different places A, B, C, D, and E, and one of them should get the Tesco home brand of ketchup, then it would be better to start backward chaining from the Tesco store and stop search when one of the places A, B, C, D, or E is reached. Has program to justify reasoning? Prefer direction that corresponds more closely to the way users think. What kind of events triggers problem-solving? If it is arrival of a new fact, forward chaining makes sense. If it is a query to which a response is required, backward chaining is more natural. 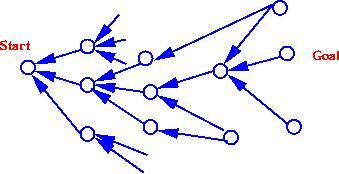 In which direction is branching factor greatest? possible matches in each single cycle. The net encodes the condition parts (IF-parts) of the rules. 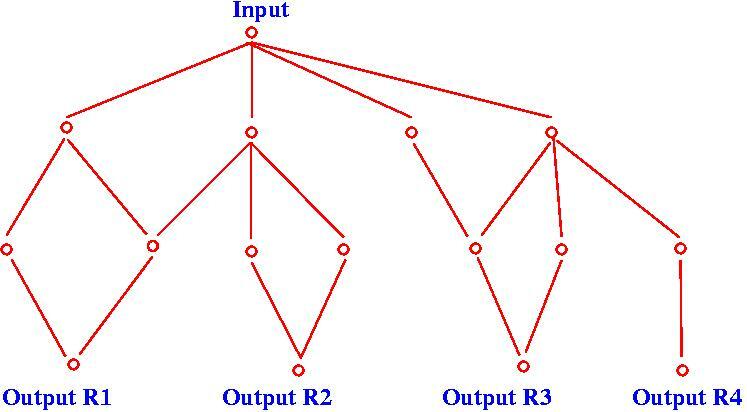 The output is the conflict set (i.e., the applicable rules). newly generated working memory elements infiltrate the net from above. If they arrive at the bottom, they enlarge the conflict set with the rule instance, else they are added as internal nodes. newly deleted working memory elements are treated analogously, but in this case the conflict set is possibly narrowed. Summary: By sharing and considering updates of the working memory elements only, the efficiency problem can be mainly solved. Decisions in conflict resolution are crucial since they can dramatically afflict the solution. Delete instantiations of rules if they have already fired. If conflict set empty, exit. 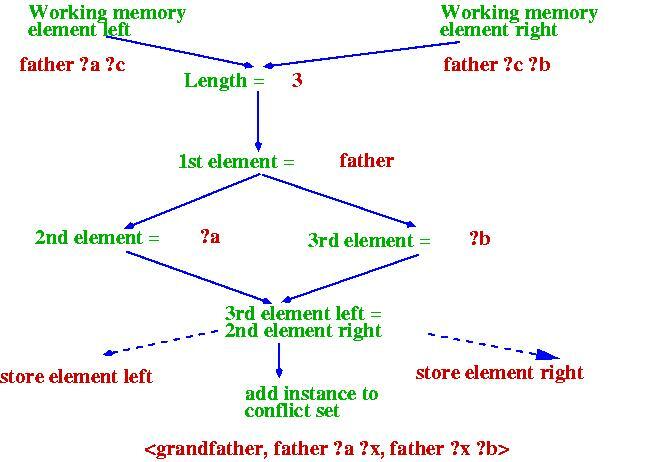 Compare generation age of elements in working memory, which match the first condition of rules. Prefer younger ones. Order the instantiations by the generation age of all the elements. LEX: as MEA, but without point 2. "2" and "3" prefer new elements in the working memory. New elements most likely describe the actual situation. "2" in MEA gives a particular semantics to the first conditions (efficiency). "4" preference to most specific rules can be used for modelling exceptions. Disadvantage: Mixture of heuristic knowledge and factual knowledge. Large knowledge bases are not maintainable. Randomness: In x out of 100 cases (probability), if the three preconditions are given, the conclusion follows. Vagueness: Whenever the preconditions are given, the action part follows, but is appropriate to a degree x only. Adequacy: In order to model the expert behaviour appropriately, the rule should be weighted with x. Mere probability may not be adequate, e.g. if a certain infection is unlikely but fatal, it must be adequately considered, the certainty value should be higher than the probability. 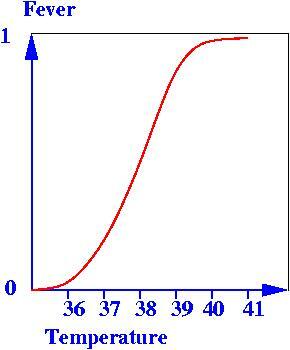 Uncertainty in facts is expressed by uncertainty values between -1 and 1. Each rule has a certainty value. THEN switch the central heating off. THEN he can get the book from the shelf. THEN the machine does not work. (In finite domains) the probability can be measured as the limit of the ratio of the positive events to all possible events, e.g. with a fair die and positive outcome 5 or 6, in the long run, there is a positive outcome in 1 out of 3 cases, i.e. Probability P(5 or 6)=1/ 3. Each random variable has a domain of possible values that it can take on. P(a|b) is the conditional probability that a is true given that it is known that b is true. E.g. 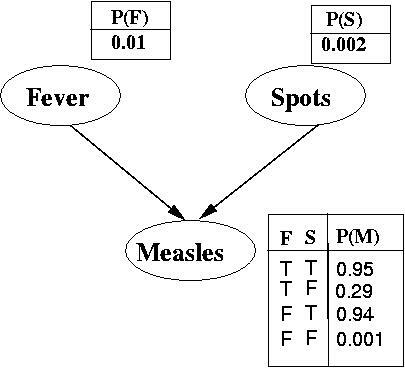 P( Measles| Spots)=0.94 is the probability that a patient has measles given that the only symptom is spots. a and b are called independent if P(a|b)=P(a). In this case P(a & b)=P(a)P(b). Where to get the numbers from, e.g. a doctor may not know the probability that a myocardial infarction causes chest pain. Take subjective rather than objective numbers. A set of random variables. A set of directed arcs linking pairs of nodes; an arc from a node X to a node Y means that X has a direct influence on Y. Each node has a conditional probability table that quantifies the effects of the parents. The value of a proposition like "John is tall" takes truth value in the interval [0;1] (no just 0 or 1). E.g. : At what temperature can a person be said to have a fever? This means, in order to derive a fact A, all rules which generate A have to be investigated. For efficiency reasons, values between -0.2 and 0.2 are ignored. For backward chaining, if B were known for sure, the certainty value of E would be 0.4* 0.7* 0.7=0.19<0.2, hence be ignored, so backward chaining can stop here. If this is the an isolated chain, the whole chain needs never to be considered. What is the meaning (semantics)? F. van Harmelen: Meta-level Inference Systems. Pitman & Morgan Kaufmann Publishers, 1991. Thomas A. Cooper & Nancy Wogrin, Rule-based Programming with OPS5, Morgan Kaufmann, 1988. Hubert L. Dreyfus & Stuart E. Dreyfus, Mind over Machine, The Free Press, 1986. Richard A. Frost, Introduction to Knowledge Base Systems, Collins, 1986. Peter Jackson, Introduction to Expert Systems, Addison-Wesley, 1990, Second Edition. Elaine Rich & Kevin Knight, Artificial Intelligence, McGraw Hill, Second Edition, 1991. The URL of this page is http://www.cs.bham.ac.uk/~mmk/Teaching/AI/Teaching/AI/l2.html.